We are all familiar with the torturous tale of little Red Riding Hood and the big bad Wolf. Following the success of NetEnt’s Jack and the Beanstalk, they bring you a further installation on the fairytale theme in the form of Little Red Riding Hood. 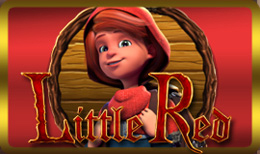 Spin the wheel on this enchanting 5 reel online slot game and mix keys and roses to guide little red through the dangerous forest to win some lovely cash rewards. Cayetano has created a strong foothold within the casino industry. This is since the developer is fully owned by Paddy Power PLC, a much more well-known company. When the company began in 2009, they had developed many games and bigger casino giants caught onto their innovative ideas and in 2011, Paddy Power bought the company outright so they could acquire the Cayeteno team as an internal software development asset. One of their latest games, Little Red Riding Hood, dares to impress as you are plunged into this dark twist of a fairy tale by Cayeteno. This dark and gothic twist on the most loved fairy-tale, Little Red Riding Hood, offers you the chance to receive a fortune, if you play your cards right! This is a 5 reel, 40 payline game and the reels are set against the backdrop of Grandma’s famous cottage bedroom, accompanied with eerie reds and purples to set the scene of this well renowned fairy-tale. The symbols in this game represent images that you would come across from reading this much loved story. These symbols include: an axe, the bed, granny’s wig and glasses, the cottage itself, as well as the traditional numbers, 9, 10, J, Q, K and A. This game offers you a maximum pay-out of 500 coins, and with the maximum spin set at £1000, you can win 500,000 if you tread carefully through the woods and access this incredible payout! The minimum bet is just 40p, so those who are unwilling to part with big chunks of their cash, they are still able to enjoy this slot-game with this low rate per spin. The bonus features on for offer in this game are the Wild, the Free spins and the Instant Win symbols. The Wild is represented by the big bad wolf, and it will substitute for all other symbols apart from the Free Spin and Instant Win. Additionally, if you manage to line up 5 of the wolf symbol, you will be rewarded with the maximum pay-out of 500 coins, as mentioned earlier. Little Red Riding Hood represents the Free Spins symbol and landing 3 of her anywhere on the reels will provide you with 15-22 free spins. During these free games, there is also a mini game feature where the axe symbols acts as a multiplier, depending how many axes you land as you spin the reels. There is also an instant win feature which is Red Riding Hood’s basket full of baked goods and whenever landed will multiply your stake up to 15x. Like the fairy tale that it’s inspired from, this slot-game keeps traditional and stays away from the modern upkeep of online casino games as it does not have many extravagant bonus features. However, the simplicity of this game makes it excel, and with a minimum starting bet of just 40p, there really is every reason to play – just watch out for Grandma’s teeth!